Ikea, again- dinner items - mmm-yoso!!! mmm-yoso!!! A blog. Seemingly random posts about seemingly random meals written by seemingly anonymous people. Hi again. Cathy blogging, because Kirk is in Thailand and ed (from Yuma) is in Yuma. I am here, with a camera inside a phone and a bit too much free time on my hands. The Mister and I were hungry the other evening, again, and were in the vicinity of Mission Valley when the pangs hit. We looked around and-there it was- a furniture store! But, Ikea is not only a Swedish based furniture store, but also serves up some tasty food, ostensibly to keep you in the store and relaxed while shopping for flat packed, oddly named furniture you assemble yourself with a L-shaped tool called a hex key(Allen wrench)and the help of drawings as your instruction. 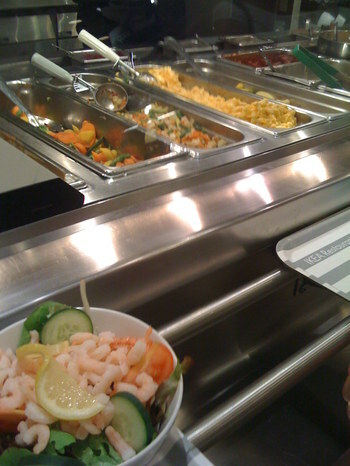 Hot items are served cafeteria style in a steam tray area. There is always a variety to choose from, (the cooked salmon plate is wonderful) (so is the stew), as are the fresh vegetable side dishes and the macaroni and cheese, but The Mister (and I) enjoy the basic 15 meatball plate. 15 meatballs (mostly ground beef and spices, no fillers) topped with a cream gravy and served with skin-on mashed potatoes and a side of lingonberry sauce. $4.99 and always good. You can buy a bag of the frozen meatballs and two packages of gravy, as well as lingonberry sauce, jelly and concentrate downstairs in the "Swede Shop" just past the check out registers so you can enjoy this meal at home anytime you get a craving (you can easily make some mashed potatoes, right?). There is an area of refrigerated glass cases where you can choose from desserts, salads, wraps and sandwiches. I got the gravad lox plate ($4.99) Two slices of excellent gravad lox served with a creamy mustard sauce, lettuce, fresh dill and a lemon wedge. 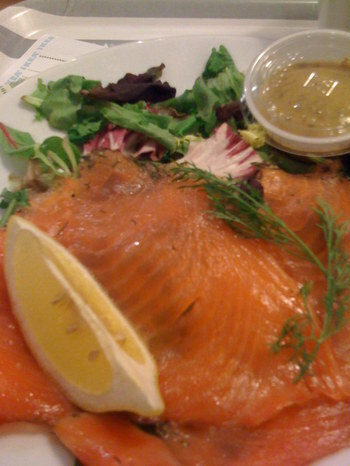 You can also buy frozen gravad lox in the Swede shop. We also decided to share a shrimp salad ($3.99). 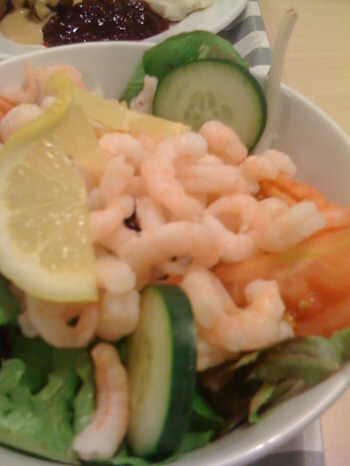 About 50 small, but flavorful-small, shrimp served on a bed of mixed greens, tomatoes and cucumbers. There is a station of sauces and dressings near the beverage area. The ranch seemed to go best, but I tried the Italian and French also. Hi Cathy, funny I was just about to put up some recent pics of meals I had at Ikea myself! I had mixed feelings about the boiled potatoes being replaced on the meatball plate (fka "manager's special") but I did enjoy the mashed version. And who knew Swedish meatballs were great on Italian pasta? Happy eatings! This is one of the best and cheapest places to eat out for a family on a budget. There are $1.99 kids meal specials too! I love IKEA! Ah, the "managers special" used to include a drink, soup or salad and bread, Dennis. I like the boiled potatoes, but these amshed were so creamy and good...since the skin is on and it was red, I think it is easier to not have waste of uneaten boiled ones. You can refrigerate mashed overnight and reheat the next day. Not that I know. Meatballs with tomato sauce=Italian, with gravy=Swedish. Welcome, James. It is a different style of food, yet somehow familiar. Hello George and welcome to this side of the blog. 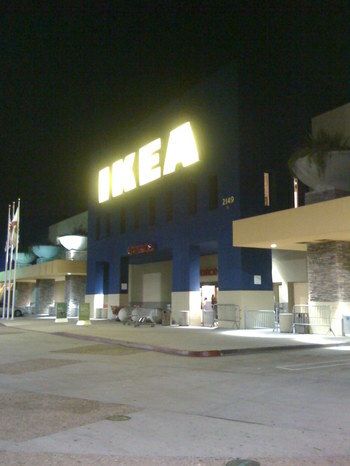 Ikea is fun to shop in as well as a place to get a great meal or snack. I do enjoy it here. I love Ikea for a cheap meal for the whole family. The kids love the $1.99 kids special. I like their vegetarian chili soup. "Meatballs with tomato sauce=Italian, with gravy=Swedish." Thanks Cathy, now I know.. I definitely like these over the ones where the recipe calls for a lot of bread crumbs.. Cheers. That chili soup is good, Caroline. I was craving soup one day and with one smell, I was hooked. that is a lot of shrimp. 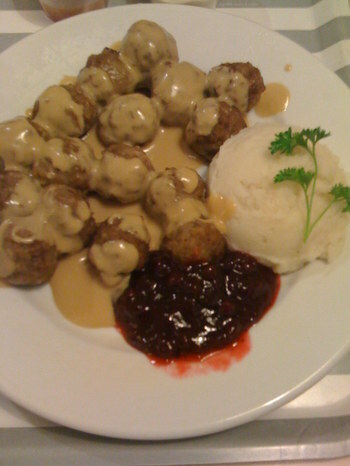 those meatballs looks great...i've never eaten at ikea, although i've noted the cheap prices the times ive been there. Hi Cathy, thanks to you and Ed for continuing to post while Kirk and the Missus are in Thailand. Thanks for the reminder of the great, cheap food at Ikea. I always forget about it. Thanks Sawyer. There is great food to be had at *all* stores with their own restaurant...they want to keep you inside and happy (see my post about Nordstrom Cafe). I am trying to keep up Kirk's pace of posts. I've never seen mashed potatoes as a side to the meatballs before! I've only seen the boiled potatoes or here in the UK, chips (fries)! Hi Su-Lin. Since they were red-skinned mashed, I think it is a cost cutting way to not have waste...and they tasted really good. I can't imagine chips with meatballs...and gravy...I have had fish and chips at a train station in Portsmouth, and that flavor is distinctive. Good memory trigger. Thanks.